An art trifecta comes to Casula (and your dog can come too). Casula Powerhouse is gearing up for not one, not two, but three stellar exhibitions opening this month. They all kick off on Launch Day on July 22 amidst food, wine and dogs. In other words, all the good things. Near x Far in Switch Gallery (on until September 17) is the first of the offerings, presenting explorations of space and dwelling — from homes to natural landscapes to the metaphysical world — by artists Rebecca Gallo, Matthew James, David Kirkpatrick and Anna Kuroda, Shireen Taweel, Grace Toiava, Hannah Toohey, and Vaughan and Vincent Wozniak-O'Connor. The artists use sound, performance, sculpture, light, photography and pattern making to investigate how space is mapped, marked and remembered. Inland Drive in the Theatre Foyer Gallery showcases Western Sydney-based Gary Smith, whose artworks reflect upon memories of commuting on the inner west and south west lines through Liverpool and Campbelltown. 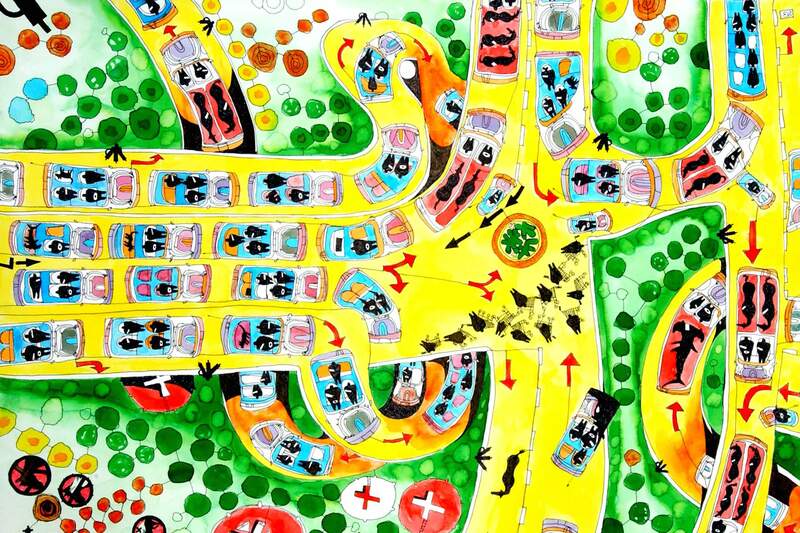 Smith uses continuous-line drawing technique in conjunction with brightly coloured acrylic and watercolour paints to map out (from an imagined, drone-like aerial perspective) the urban landscape he grew up in, where carparks and shopping centres have replaced paddocks in a steady urban sprawl. You can check it out until August 10. Last but not least, dog lovers shouldn't miss Every Dog Will Have Its Day (also closing September 17) — a playful show in which ten contemporary artists including Abdul-Rahman Abdullah, David Capra and Anastasia Klose explore the enduring bond between humans and their dogs — plus the varied purposes dogs have fulfilled over history (workers, protectors, faithful companions). Emerging curators Sophia Cai and Kathleen Linn oversee this show ranging across sculpture, video, drawing, painting and performance. Go on, make a day of it. Image: Gary Smith, 'Grid Locked' (2016).